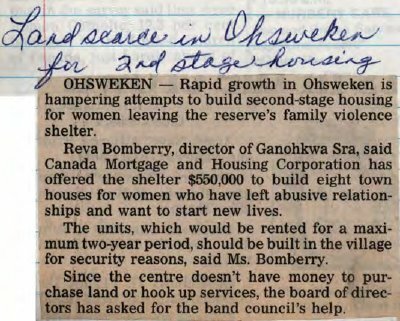 "Land scarce in Ohsweken for second stage housing"
OHSWEKEN - Rapid growth in Ohsweken is hampering attempts to build second-stage housing for women leaving the reserve's family violence shelter. Reva Bomberry, director of Ganohkwa Sra, said Canada Mortgage and Housing Corporation has offered the shelter $560,000 to build eight town houses for women who have left abusive relationship and want to start new lives. The units, which would be rented for a maximum two-year period, should be built in the village for security reasons, said Ms. Bomberry. Since the centre doesn't have money to purchase land or hook up services, the board of directors has asked for the band council's help. Ganohkwa Sra ; Canada Mortage and Housing Corporation.